Phospho-Ack1 (Tyr284) Antibody detects transfected levels of Ack1 only when phosphorylated at Tyr284. Polyclonal antibodies are produced by immunizing animals with a synthetic phosphopeptide corresponding to residues surrounding Tyr284 of human Ack1. 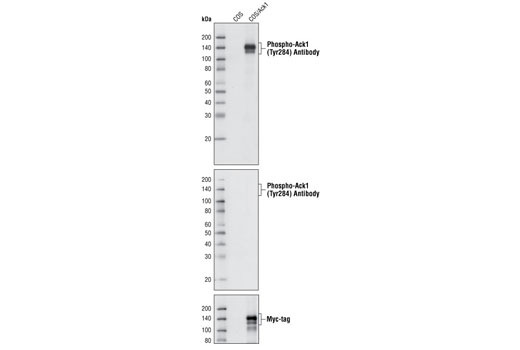 Antibodies are purified by peptide affinity chromatography. Ack1 and Ack2 (activated cdc42-associated kinase 1 and 2) are non-receptor tyrosine kinases that consist of a tyrosine kinase core, an SH3 domain, a cdc42/Rac-binding (CRIB) domain, a Ralt homology region and a proline-rich region (1,2). Ack1 and 2 are the only two tyrosine kinases known to interact with cdc42. Both Acks are activated by growth factors including EGF and PDGF, as well as by activated integrins through cell adhesion, and may serve to link receptor tyrosine kinase or G protein-coupled receptor signaling with cdc42. Acks may regulate cell growth, morphology and motility (3,4). Recent findings indicate that Ack1 may play a role in prostate tumorigenesis, making it a potential drug target for this type of cancer (5). Tyr284 is located in the activation loop of Ack1 and is a primary autophosphorylation site critical for Ack1 kinase activity (5). Galisteo, M.L. et al. (2006) Proc. Natl. Acad. Sci. USA 103, 9796-9801. Yokoyama, N. and Miller, W.T. (2003) J. Biol. Chem. 278, 47713-47723. Yang, W. and Cerione, R.A. (1997) J. Biol. Chem. 272, 24819-24824. Yang, W. et al. (2001) J. Biol. Chem. 276, 43987-43993. Mahajan, N.P. et al. (2005) Cancer Res. 65, 10514-10523. Yokoyama, N. and Miller, W.T. (2006) Methods Enzymol. 406, 250-260.